With that in mind, here is an unassailable guide for dummies -- myself included, since I made the darnn thing -- to crushing your bracket pool. May the odds be ever in your favor. There's an urban legend that's been floating around for decades that the mascot matchup is as important to consider as the on-court matchup. I regret to inform you that it is, in fact, not urban legend. It's every bit as important to consider. Bracketology 101: The higher-seeded team is the better team in the eyes of the NCAA Tournament selection committee. That means that -- and you won't believe this -- No. 1 seed Duke, for example, was believed to have a better resume than No. 2 seed Kentucky on the season. The lower the seed, the better off you are. It's like a twisted version of golf, but better. It's a novel concept, really. If you can grasp it, you're on your way to becoming a junior Bracketologist. Maybe Jerry Palm will consider mentoring you, even, but only with the understanding that you will sleep roughly 12 total hours between March 1 and March 15 each year. Sorry, them's the rules. I will refer you back to Nos. 1 and 2 in this post and encourage you to go with God, but my expert opinion is that a No. 16 seed defeating a No. 1 seed is extremely unlikely. Like, only once-has-it-ever-happened unlikely. Sure, that one instance came last season, when No. 16 seed UMBC defeated No. 1 overall seed Virginia in stunning fashion. But don't let recent history fool you -- predicting a 16 to beat a 1 is the equivalent of hitting the lottery on your birthday at exactly 12:01 p.m. ET. The chances are really, really low. Just go chalk and move on. You will have plenty of other opportunities to go bold elsewhere. No. 1 seeds are 135-1 all-time, and likely to be 139-1 this time next week. If you really want to feel en vogue at the office, I suggest picking at least one 12-over-5 upset. Maybe two. Three if you're feeling super frisky. Four if you just finished a full pot of coffee. No. 12 seeds have fared really well in the tournament over the years. Per the NCAA, No. 12 seeds have won at least one first round game in 29 of the last 34 years, and achieved a 47-89 record. The only time it didn't happen, in fact, came in 1988, 2000, 2007, 2015 and 2018. 47-89 is a track record not even Johnny Manziel would be proud of, but the odds of an upset in the first round in a 12-5 matchup are pretty high. For my money, No. 12 seed Oregon over No. 5 seed Wisconsin is the one I'm eyeing. No. 5 Marquette vs. No. 12 Murray State in the West Region is intriguing too, especially with Racers star Ja Morant, a projected top-3 pick, guiding them. 5. Which school colors are your favorite? This is not a trick question, I'm actually asking: Do you prefer orange over green and gold? Pick Syracuse to win its first-round game against Baylor! Does your color palette or family schooling history prevent you from enjoying maize and blue? Say sorry to Michigan and wish them well as you pick an upset. Montana over Michigan in round one? Why the heck not? The whole premise of this guideline is to go with your gut! Now, just because you like Gardner-Webb's colors, doesn't mean I think you should go wild and pick them to win it all. In fact -- don't do that. You will look silly. But if you're considering Gardner-Webb to upset No. 1 seed Virginia in the first round, the school colors should be considered before you pass judgement. Also: Virginia lost in the first round to a 16 seed last season. So there! This isn't a history lesson, but it does seem to repeat itself in the case of the NCAA Tournament. Each year since the field was expanded to 68, making room for a "First Four" to be played ahead of the 64-team bracket, a team from the First Four has advanced at least one game. Four teams -- VCU, La Salle, Tennessee and Syracuse -- have advanced to the Sweet 16. This year your options (unless you're picking a No. 16 seed team playing its way in for a right to get smashed by a No. 1 seed, which, again, I urge you not to do) are Belmont/Temple or Arizona State/St. John's. Ask a wise man, they'll point you to Belmont. Ask a snark, they'll tell you Belmont is 0-7 in the NCAAs. I won't guide you one way or another, but I would suggest throwing a dart and picking at least one of those four teams to win multiple games. This point can serve as an addendum for point No. 3, and while it's one of the most duh points thus far, it's worth pointing out. No. 1 seeds in the NCAA Tournament since the field expanded in 1985 have won 20 of the 34 champions crowned during that time. Six of the champions this decade -- Duke in 2010, Kentucky in 2012, Louisville in 2013, Duke in 2015, UNC in 2017 and Villanova in 2018 -- were all 1 seeds. Per statistics from the NCAA, of the 68 teams who have played in the title game since '85, 32 have been 1 seeds. This one might run counter to what I just advised you, but hear me out: I'm not hating. I very much like Virginia's roster, its coach, Tony Bennett, and especially its Kyle Guy-Ty Jerome-Deandre Hunter combo. But its system I simply do not trust. Last season it got them booted in the first round, the first ever No. 1 seed to lose to a No. 16 seed. In year's past, the Cavaliers seem to annually nosedive earlier than expected. In 2001, they lost as a No. 5 seed to 12 seed Gonzaga in the first round. In 2007, they lost as a No. 4 seed to No. 5 seed Tennessee. In 2014, they lost as a No. 1 in the Sweet 16 to 4 seed Michigan State. In 2015, it was again Michigan State -- this time as a No. 7 seed -- that knocked them out, this time as a No. 2 seed. In 2016, they lost as a No. 1 seed to No. 10 seed Syracuse. And in 2018, they lost as a No. 1 seed to No. 16 seed UMBC. 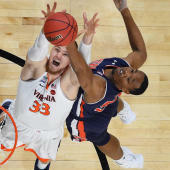 There's been some extraordinary successes in the regular season for Virginia under Tony Bennett against elite competition, which suggests that his system isn't flawed and, rather, his team's have been extremely unfortunate -- a notion I might even agree with. But in any case, I'm not trusting Virginia. You should follow my lead. There's always that guy in accounting who has crunched the numbers and concluded that flipping a coin to decide games is statistically as reliable as trusting your eyes. That guy is wrong. He's also the guy every year who parades around the office yelling, "MY BRACKET IS BUSTED!" while demanding he get at least one do-over. Do not be that guy. Trust your eyes (and these rules). Do not flip a coin. Seriously. If a team is constructed of future NBA talent, there's a decent shot they will keep winning. That's why Duke -- made up of Zion Williamson, RJ Barrett, Cam Reddish and Tre Jones, all likely first-rounders -- is the favorite to win it all. Outside Duke, though, this rule is translatable. Torn on who to pick in the Murray State-Marquette game? Murray State has a guard named Ja Morant who plays like he's Russell Westbrook's more efficient clone. How about the Arizona State-St. John's play-in game? The Sun Devils have a future pro in Luguentz Dort, but the Johnnies are stacked, too, led by guard Shamorie Ponds. Use our 2019 NBA Draft prospect rankings as a cheat sheet and it will guide you.